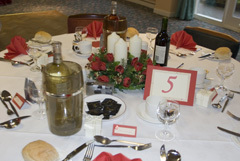 Finishing Touch Caterers is the friendly catering business in Greater Manchester. We have catered in most areas of the county and can bring particular expertise to your event, whether your needs are for corporate catering, club meetings, and family gatherings. Plus, we can now offer new lower prices from April 2013. Please do contact us to discuss any requirements you may have. We can and have catered for many types of corporate catering, whether they be for small meetings within your club or association, or whole departments running to over a hundred people. We have a long list of satisfied corporate customers that we hope you’ll find rewarding to join. Choose from a wide and varied selection of delights from Finishing Touch Caterers to ensure quality catering on the most important day of your life. We’d love you to be in touch to discuss your requirements. We at Finishing Touch pride ourselves in meeting and exceeding your expectations for your private functions. We have expertise in catering for small groups at home to large marquee events. Contact us to discuss your individual requirements.